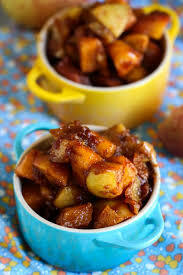 Chop apples and put all ingredients into pot with ¼ cup water and cook until it is soft and creamy. Eat 1 hour after food or at least 1 hour before other food. In a pan toast sunflower seeds. Mix coconut and sesame seeds together and toast until coconut is lightly browned. Blend dates and maple into puree and add almond butter, toasted sunflower and crispy rice together. 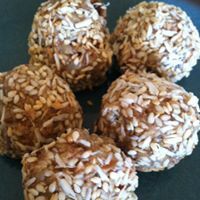 Form small balls and roll in coconut/sesame mix. Keeps in refrigerator up to three weeks. You can use sunflower butter or make sure there are no skins in the almond butter for Pitta. Kapha in moderation. Grease a large bread pan with coconut oil. In a medium size bowl, whisk together the eggs and add vinegar. Add mashed bananas, coconut oil, vanilla (and maple syrup if wanted.) Whisk together until combined. Allow to cool for 10 min. Remove from pan. 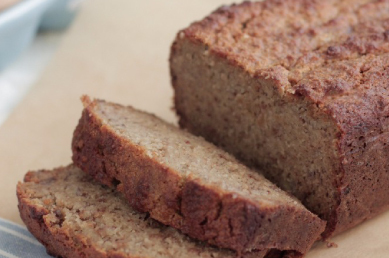 Slice and enjoy with lots of pastured butter or ghee!